Danish Army Specific: Received along with the WC 51 as part of the American MDAP short after WW II. A small amount of the delivered vehicles was the Canadian build T236 which were produced in 1944 to 1945. Apart from the slightly larger engine (3.868 cm3 (236 cubic inches)) it only differs from the WC 51 in detail. Typical role was Command and Control, Cargo Carrier and tractor for a 120 mm mortar. 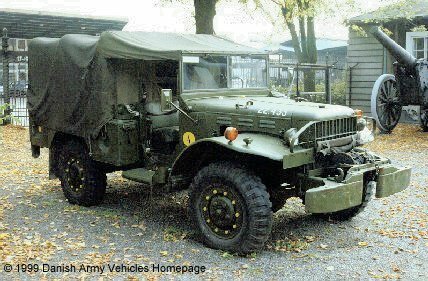 Historical: The T214 series, which the WC 52 3/4-ton truck is part of, was Dodge´s successor to the 1/2-ton models with whom it shared a 80 % parts interchangeability. Prototypes of this new series were produced by both Chrysler Corporation and Ford in late 1941, but it was Chrysler´s Dodge Division which were awarded the contract, producing the trucks at the Mound Road plant in Detroit. It was the first Dodge truck to be designed from scratch for military purposes. Almost 34.000 WC 51 & WC 52 were produced between 1942 and 1945. Total production figures of the complete T214 range exceeds 250.000. Length: 4.47 m (176 inches). Width: 2.10 m (83 inches). Height: 2.15 m (85 inches). Weight: 3.307 kg (7.350 lb.). Engine: Dodge T214 6-cylinder, 3.772 cm3 (230 cubic inches) displacement, liquid cooled, carburettor. Horsepower: 92 at 3.200 rpm. Transmission: 4-speed, type New Process. Transfer case: Single-speed, type New Process. Electrical system: 6 or 12 volt, negative ground. without preparation: 0.8 m (34 inches). Fuel capacity: 136 liter (30 gallons). Range: 384 km (240 miles). Additional: 2.5 ton Braden winch, type MU2. Dodge WC 52 (Telephone Maintenance) (48 kb).